In the 1820s the missionary (and ex-naval officer) Henry Williams built a trading schooner. The Herald was launched on 24 January 1826 at the Paihia mission station. 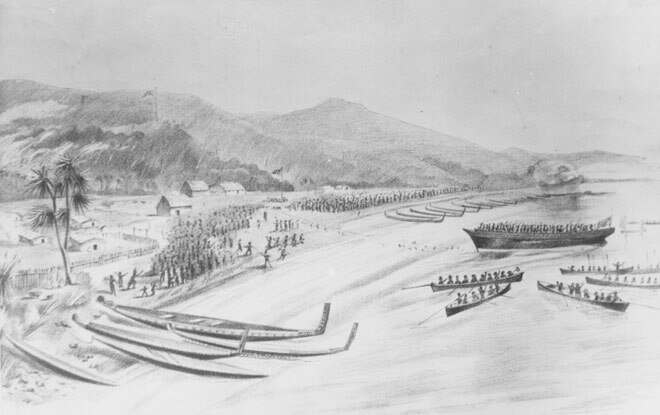 Williams's wife Marianne, who made this sketch, reported that 3,000–4,000 Māori gathered 'partly', she claimed, 'in hope of payment'. Expecting that the Herald would be hauled into the water like a waka (canoe), the Māori people were reportedly amazed when the vessel slid smoothly into the water, and some threw spears at her. Like many early ships, however, the Herald had a short life. In May 1828 she was wrecked on the Hokianga bar, the missionaries and crew being forced to swim ashore at 4 o'clock in the morning.